The International Court of Arbitration of the International Chamber of Commerce (ICC) is the most preferred arbitral institution in the world according to a new market survey, which also confirms that arbitration remains the preferred method of resolving cross-border disputes over litigation. Conducted by the Queen Mary University of London, the 2015 survey, Improvements and Innovations in International Arbitration, shows ICC topping the chart of preferred institutions by a significant margin and highlights ICC’s enduring footing as a leader in the field of arbitration for over 10 years. 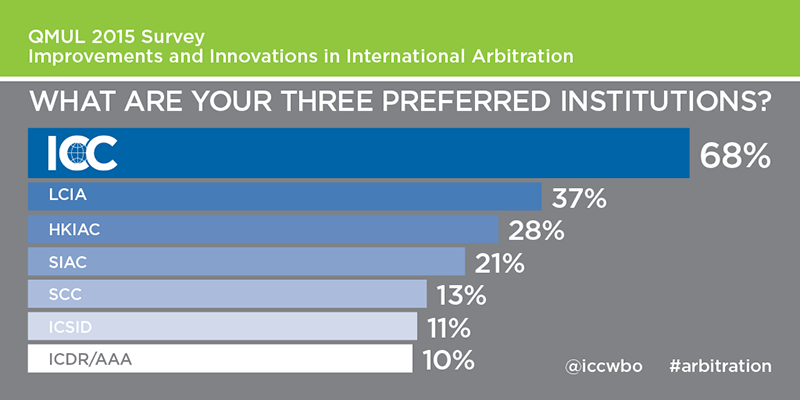 Over two thirds of respondents to the survey identified ICC as one of their three preferred arbitral institutions. Comprising arbitrators, counsel, arbitral institution staff, private practitioners, witnesses, academics and other individuals active in international arbitration, respondents to the survey cited ICC’s internationalism and high-quality services as reasons for its dominant position. “We’re delighted that the ICC Court again tops the list of preferred arbitral institutions in the Queen Mary survey. Our arbitration services combine our reputation and experience built over close to 100 years with continued efforts to keep pace with the evolving needs of users and legislative and technological developments,” said Alexis Mourre, President of the ICC Court. Our arbitration services combine our reputation and experience built over close to 100 years with continued efforts to keep pace with the evolving needs of users and legislative and technological developments. According to the survey, the top three reasons why arbitration users prefer certain institutions to others are: high level of administration (including proactiveness, facilities, quality of staff), neutrality/’internationalism’ and global presence/ability to administrate arbitrations worldwide. Headquartered in Paris, a preferred seat for arbitration according to the survey, the ICC Court administers approximately 1,500 cases at any given time and is well on the road to a record-breaking year in 2015 according to recent case statistics. With case management offices also in Hong Kong and New York, ICC is the only institution of its kind to have such an extensive geographical presence. “Reputation and recognition attracts users, and a positive user experience in turn encourages more frequent use of the institution,” the survey stated. ICC also ranks among the survey’s top three most improved institutions over the past five years, for which respondents cited reputation, high level of administration and greater efficiency as the most important grounds of improvement. Having sought the opinions of stakeholders at all levels in international arbitration, the survey clearly shows (90% of respondents) that international arbitration remains the preferred dispute resolution mechanism over litigation. Arbitration is the main solution offered by ICC’s dispute resolution services. The ICC Rules of Arbitration are available in many languages and were last update in 2012 to meet the growing complexity of trading today. Follow ICC on LinkedIn International Chamber of Commerce.